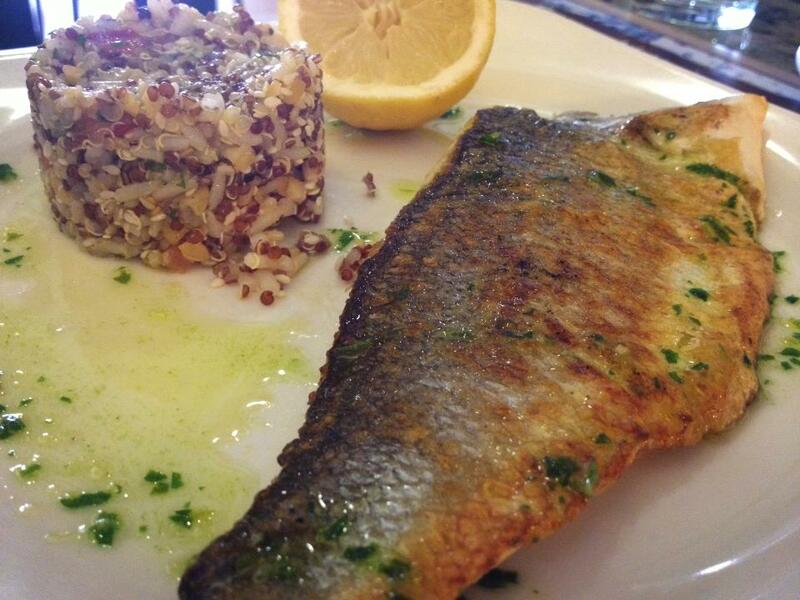 Branzino (Dicentrarchus labrax) | Better Know a Fish! My local brasserie hosts a French conversation happy hour each week, and “animals” was the theme of our most recent session. Our linguistic ark covered the land, air and sea: renard is fox, lapin is rabbit, canard is duck, dindon is a tom turkey, and so forth. When we reached les poissons, one name stood out: loup de mer — the “wolf of the sea”. The European seabass (Dicentrarchus labrax) is another classic fish of Europe, known by a multitude of names. Loup de mer and bar commun are among its French names, while in German it is the Europäischer Wolfsbarsch. In Spain it can be listed as lubina or róbalo, and in Greek, Hebrew and Turkish, the names lavráki, lavrak, and levrek refer to the same fish, respectively. In the United States of late, many restaurants have taken to adapting its Italian moniker — branzino, or branzini in plural, alternatively spelled bronzino and bronzini. 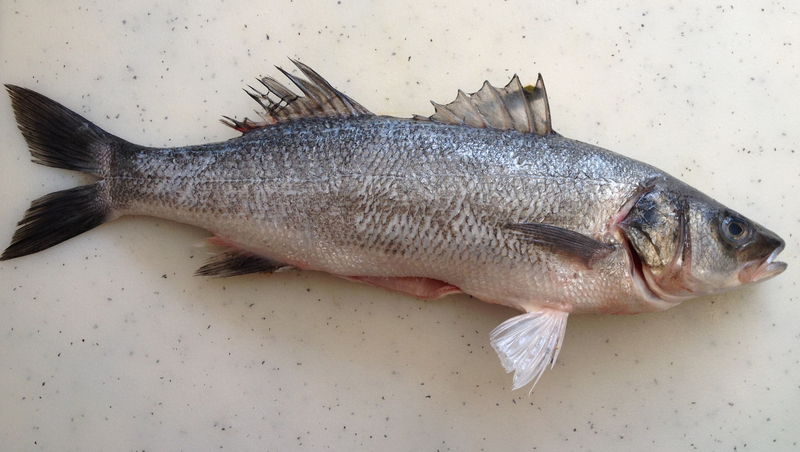 According to the Italian Wikipedia, branzino is used in northern Italy, whereas spigola is used in peninsular Italy, ragno in Tuscany, and pesce lupo elsewhere. 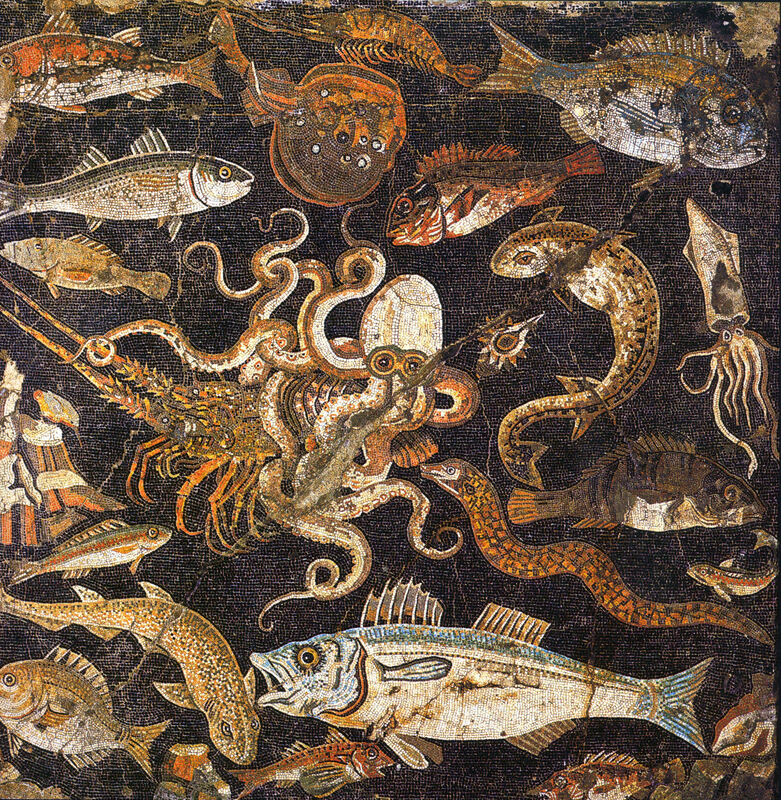 In fact, we can find this fish in the same 1st Century Roman mosaic where we found the previously discussed dorade royale — and also in the most recent season of Mad Men, where Don Draper’s paramour Sylvia Rosen orders it at an Italian restaurant. The European seabass is native to the eastern Atlantic Ocean, north to Norway and south to Senegal and the Canary Islands, and the Mediterranean Sea and the Black Sea on the interior. It is an extremely adaptable fish, capable of tolerating temperatures from 41 degrees to 82 degrees Fahrenheit (4 to 28 degrees Celsius) and a wide range of salinity. As a result, loup de mer can be found in cold, coastal waters as deep as 320 feet (100 meters), though more often in shallower, inshore waters and estuaries. I was able to buy whole bronzini at my local fishmonger in California, which sourced it from an aquaculture company in Cyprus. The bronzino is considered by the United Nations Food and Agriculture Organization (FAO) as the most important commercial fish widely cultured in Mediterranean areas, with Greece, Turkey, Italy, Spain, Croatia and Egypt the biggest producers as of 2006. With monikers like “wolf of the sea” and wolfsbarsch, it should come as no surprise that the European seabass is a predator, feasting on other fish as adults and on shrimp and other invertebrates as juveniles. Indeed, the European seabass is a prized target of sportsfishers, with maximum records of 3 feet (1 meter) and 26 pounds (12 kilograms). From branzini to loup de mer, I’ve thrown around a number of international names hereabouts, but let us end with a look at its English name: seabass. That explains nothing, if you don’t already know what a sea bass is, or have a completely different mental image of a sea bass than the other person. So let’s review a few commonly encountered “sea basses”. Our fish — loup de mer, branzino, Dicentrarchus labrax — is a species in Family Moronidae, which are more accurately (though rather unexcitingly) known as the “temperate basses” due to their known range in temperate-climate waters. The temperate basses can be found on both sides of the North Atlantic Ocean, and North American anglers will recognize the freshwater species white bass (Morone chrysops) and yellow bass (Morone mississippiensis), and the well-known coastal species striped bass (Morone saxatilis) or “striper”. So for North American readers, the best and most correct way to describe our fish would be “it’s a European relative of striped bass”. Beyond this comparison, the world of “sea basses” starts to get confusing. 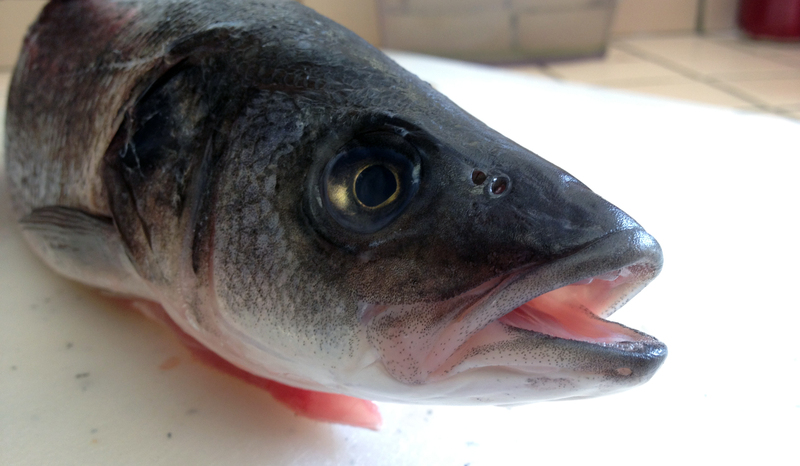 Chefs and saltwater anglers in the Atlantic U.S. will recognize the black sea bass (Centropristis striata) — which belong in Family Serranidae, the sea basses and groupers. This is an extraordinarily diverse group with 500-plus species found in tropical and temperate seas worldwide, and the group that can most appropriately be called “sea basses”. 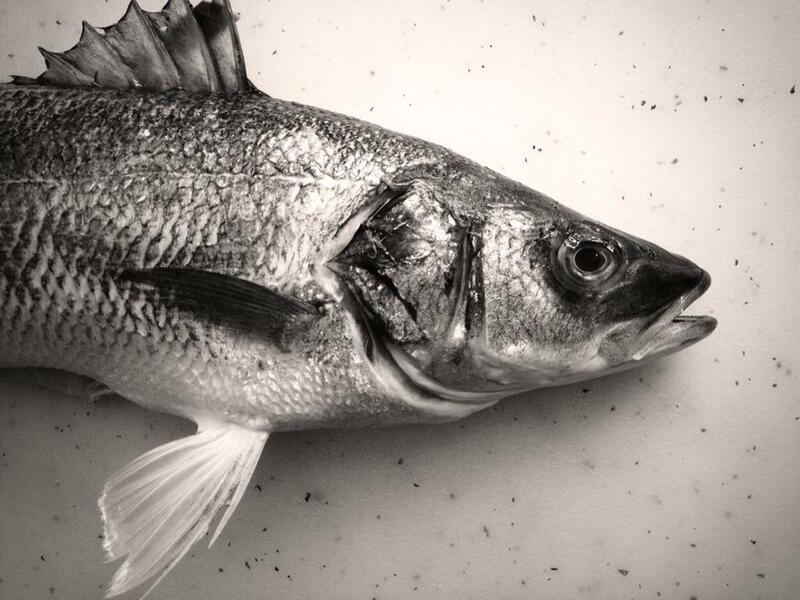 Chefs and saltwater anglers in the Pacific U.S. will encounter the name white seabass (Atractoscion nobilis). But as we discussed in an earlier Better Know a Fish entry, the white seabass or corvina blanca is actually a drum fish in Family Sciaenidae, and not related to either temperate or sea basses. 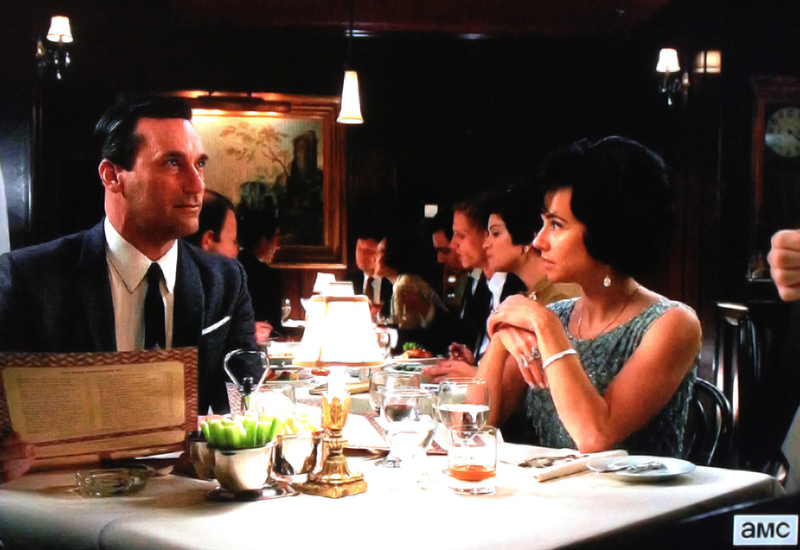 At this point, the use of “sea bass” is a matter of convenience for familiarity. Which brings us to the worst offender — the Chilean seabass (Dissostichus eleginoides), a fish whose name is entirely an enterprising invention. Now a popular and rather expensive fish, “Chilean seabass” was coined by an American fish merchant in 1977 to market an otherwise undesired and accidentally caught species from sub-Antarctic waters. Belonging to Family Nototheniidae, this bottom-dwelling, long-living deepwater fish was originally called “Patagonia toothfish” — and with a face that only an ichthyologist would love, it bears zero resemblance to sea basses and temperate basses. There are many more “sea basses” out there, referring to various species depending on the geographic region, appropriately used for some and egregiously misused for others. But this short list shows that in some ways, it may be quite useful to refer to a fish by its native, non-English names. You could probably ask for branzino or loup de mer at a good fish market or seafood restaurant, and likely receive the correct fish or at least told it isn’t offered — and if they have zero idea what you’re talking about, at least you won’t be duped into buying something different (although you should probably find a new market/restaurant). But imagine if you simply asked for “sea bass” — heaven knows what you might actually be getting. This entry was posted in Actinopterygii, Estuarine Fish, Freshwater Fish, Marine Fish, Perciformes and tagged Atlantic Ocean, bar commun, bar européen, branzini, branzino, bronzini, bronzino, Dicentrarchus, Dicentrarchus labrax, Europe, European seabass, foodfish, gamefish, gemeiner seebarsch, gemeiner wolfsbarsch, lavrak, lavraki, lavraq, levrek, llobarro, llop, loup de mer, lubina, Mad Men, Mediterranean, Moronidae, Perciformes, pesce lupo, ragno, robalo, spigola, temperate basses. Bookmark the permalink. I never knew Dicentrarchus labrax is actually sea bass!! One of my favorites! My wife is from Guyana,and one day brought in a Bronzini. She said that all the Russians in our neighbourhood were snapping up the fish as fast as it came. 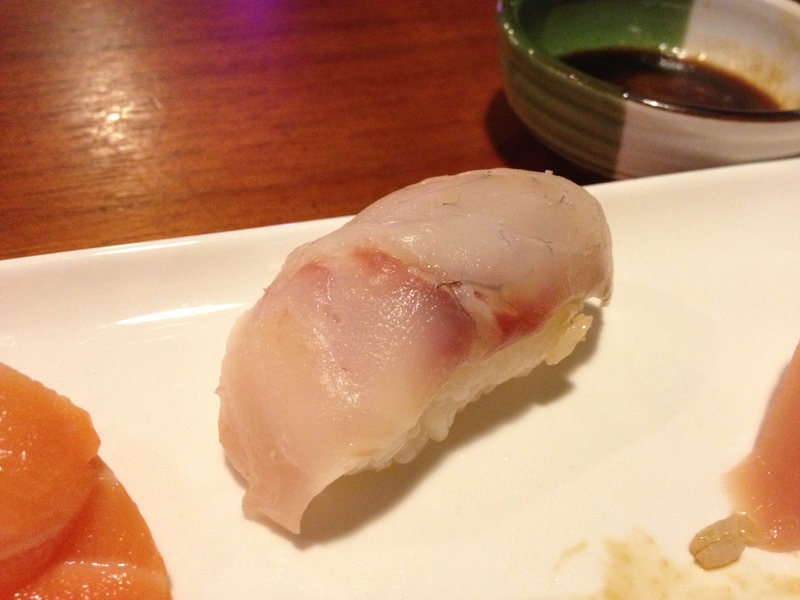 It was one of the most delicious species of fish I have ever had in my 72years of eating fish all over the world. I still confused as I find that striped Bass is the closest to this species. Is this fish available in American waters? 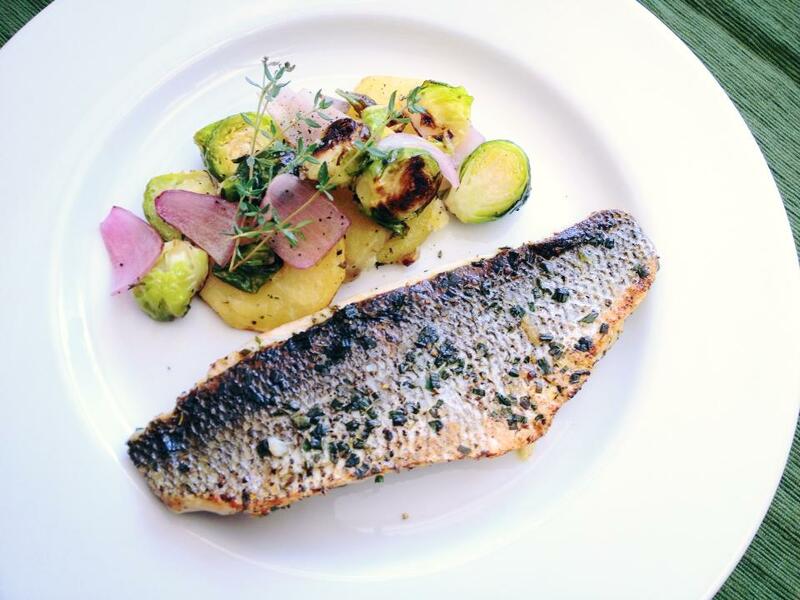 You are correct — striped bass is closely related to bronzini! Wild striped bass is available in the U.S. Atlantic coast. 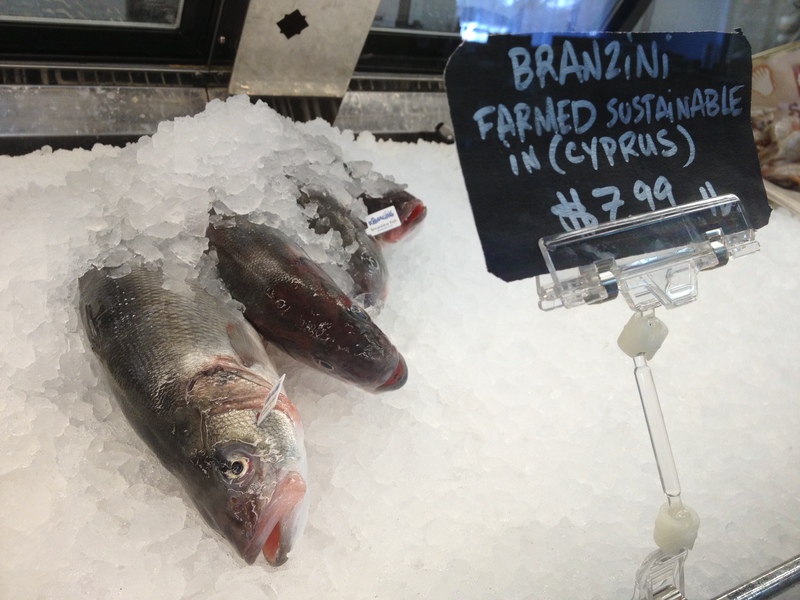 Wild bronzini are found in Europe in the Atlantic and Mediterranean, and I believe bronzini sold in the U.S. and the Americas are usually farm-raised fish from the Mediterranean. I had my first experience with Branzino at a Porsche 917 restaurant and since then I am hooked. I do go to a fishmonger in Costa Mesa, CA for my cravings. However I am going to visit Spain (Barcelona) and Italy (Rome) and would like to try their methods. What should I ask for – there are too many names! Great question, Pat! Try some of the names listed here!